The Scottish Socialist Party (SSP; Scottish Gaelic: Pàrtaidh Sòisealach na h-Alba; Scots: Scots Socialist Pairtie) is a left-wing political party campaigning for the establishment of an independent, socialist Scotland. It operates through a local branch structure and publishes Scotland’s longest-running socialist newspaper, the Scottish Socialist Voice. At the height of its electoral success, the party had six Members of the Scottish Parliament (MSPs) and two councillors. Since 2007 it has had one councilor but no MSPs. The party, founded in 1998, has more than 30 branches campaigning for Scottish independence, against cuts to public services and welfare, and for democratic public ownership of the economy. The SSP was one of three parties in Yes Scotland, the official cross-party campaign for Scottish independence in the 2014 referendum, with national co-spokesperson Colin Fox sitting on its Advisory Board. In 2015, the SSP affiliated to RISE – Scotland’s Left Alliance, an electoral alliance for the 2016 elections. The Scottish Socialist Party emerged from the Scottish Socialist Alliance (SSA), a broad-based group of left-wing organisations in Scotland. The decision was taken to transform the SSA into a party to contest the first elections to the new Scottish Parliament, where the SSP polled well and saw Tommy Sheridan, then convenor of the party, elected in Glasgow. The period following that election saw sustained growth for the SSP, where it doubled in size in twelve months, and theRMT trade union affiliated to the party. In 2003, the SSP was buoyed by the election of five additional MSPs across Scotland. On 11 November 2004, Sheridan resigned as convener of the party, citing personal reasons. He was replaced by Colin Fox, a Lothians MSP, in the 2005 leadership election. Following Sheridan’s resignation, the News of the World revealed that he had an extramarital affair and visited a swingers’ club in Manchester. Sheridan denied the stories and launched legal action against the newspaper. During the high-profile media circus, the SSP was thrown into turmoil as Sheridan publicly branded those who refused to support him as “scabs”. Leading SSP figures, including the party leader, refused to lie for Sheridan in court. Sheridan won the initial legal action but eventually went to jail for perjury in 2010, which the party said discredited him and vindicated their position. Neither the SSP or Sheridan’s breakaway party won seats in the 2007 elections to the Scottish Parliament. The SSP did experience a recovery in by-elections from 2008–09, increasing its vote compared to the 2007 national result. The party contested the 2009 European elections around the slogan of “Make Greed History”, campaigning for a Europe-wide tax on millionaires, and also achieved a higher vote share than in the Scottish Parliament election. The party ran ten candidates in the 2010 general election, and said the blame for the eventual Conservative victory lay “with New Labour and the failure of Tony Blair and Gordon Brown these last 13 years, who have quite frankly exploited working people, with the poorest and most vulnerable being hit hardest”. Fox said his party’s manifesto would tackle the “worst economic crisis in 80 years” without punishing ordinary people. The SSP launched its manifesto for the 2011 Scottish Parliament election with promises to oppose cuts and tax the rich.The party contested all eight Scottish Parliament regions with gender-balanced lists of candidates. Following the 2011 elections to the Scottish Parliament and the resulting SNP majority, the Scottish Government announced its intent to hold an independence referendum in 2014. In May 2012, a cross-party organisation called Yes Scotlandwas established to campaign for a Yes vote. The SSP’s national co-spokesperson, Colin Fox, was invited to sit on its Advisory Board, reflecting the party’s crucial support for independence over the past fifteen years. This was done at the insistence of Yes Scotland’s non-partisan chief executive, Blair Jenkins, in the face of SNP opposition. During the referendum campaign, the party continued to campaign on other issues including the bedroom tax, fuel poverty, equal marriage, and the latest Israel-Gaza conflict. 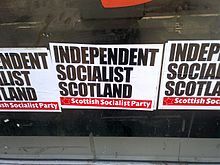 On 11 September 2013, the SSP launched a pamphlet called The Case for an Independent Socialist Scotland, the publication of which was welcomed by MSPs. It has become the party’s fastest-selling pamphlet ever. In June 2014, the party published another pamphlet outlining its case for “a modern democratic republic”. In response to the publication of Scotland’s Future, the party issued a statement which said the Scottish Government’s document had set out a vision that represents “significant advance for the people of Scotland”, but reaffirmed the SSP’s commitment to socialism. In an interview with the Sunday Herald in late August 2014, Colin Fox said: “The SSP has brought a proletarian sense to Yes Scotland and reminded people the decisive issue is whether people think they’re going to be better off. It’s not the currency, it’s not the EU, it’s not those highfalutin’ chattering class issues.” He said that the party brought “a sense of the schemes, the workplaces, the unions” to the campaign. After the announcement of the referendum result, the SSP was among political parties that reported significant increases in the size of their membership.Prominent new members included Labour for Independence founder Allan Grogan. The Scottish section of Socialist Appeal left Labour to join the SSP. The SSP did, however, make a written submission to the Commission which called for wide-ranging fiscal autonomy, with all tax revenues raised in Scotland to be spent by the Scottish Parliament. The SSP’s annual conference in 2013 was reportedly the party’s biggest conference in several years. It was the first SSP conference to be streamed live over the Internet. At the conference, members called for the abolition of theOffensive Behaviour Act, for fracking to be banned, a lowering of the pension age to 55, scrapping TTIP, and to support an electoral alliance of pro-independence candidates for the next UK general election in Scotland, which failed to emerge. The SSP started the process of mounting an SSP challenge in that election in November, while remaining “open to discussions” on a formal alliance until giving up in December. The party launched its manifesto in Edinburgh on 15 April 2015 with pledges to introduce a £10 minimum wage, ban zero hour contracts, nationalise the energy industry – including oil and gas fields – and end austerity. Ken Ferguson, editor of the Scottish Socialist Voice, said it “would be better for the SNP to win seats than Labour, but the SNP is not a party that is going to provide socialist answers” and the SSP is standing “as a principled socialist party, for public ownership, against austerity and our key election demand – the £10 minimum wage, not to be introduced in two years, or five years, but now”. The SSP’s candidates pledged that, if elected, they would accept no more than the average worker’s wage in their constituency for their salary. They were not elected. For more details on this topic, see Scottish Parliament election, 2016. At the party’s annual conference in Edinburgh in May 2015, the SSP voted “to begin negotiations with other socialists about presenting an electoral alliance for 2016”. The party also announced a series of pickets and demos to take place across Scotland to coincide with the State Opening of Parliament, challenging the Conservatives’ mandate to govern. By August, the party announced it would field candidates as part of the new electoral alliance, RISE – Scotland’s Left Alliance. RISE failed to win any seats in the Scottish Parliament. The SSP’s subsequent annual conference in June 2016 passed a motion which “recommends the SSP re-evaluates our relationship with RISE to find a sustainable role for left unity going forward”, while asserting that the party’s priority over the coming year “must be to grow the influence and authority of the SSP itself”. The conference also elected a new executive committee, with Sandra Webster standing down as joint national spokesperson and being replaced by Katie Bonnar, a teacher from Glasgow. The SSP strongly supports Scottish independence. It co-ordinated the rally for independence at Calton Hill in October 2004 and wrote the Declaration of Calton Hill, which sets out a vision of an inclusive and outward-looking republic. The party has argued the case for a Scottish socialist republic without a monarchy or nuclear weapons, with a greatly reduced level of military spending and a relationship with the European Union that safeguards Scotland’s independence. Its support for a republic and an independent currency is at odds with the SNP’s opinion that the Union of the Crowns and use of the pound sterling should continue. SSP member and former Labour MP and MSP John McAllion has said socialists “cannot be fellow travellers on [the SNP’s] road to independence”. The national self-determination sought by the SSP is driven by internationalist rather than nationalist concerns. It seeks to build an inclusive country which is run by and for the benefit of all who live in Scotland. As such, it supports the rights of asylum seekers to settle there, without fear of detention or deportation; opposes the expansion of the UK state, for example through ID cards; and seeks the abolition of the monarchy. Through prioritising independence as a key component in its political philosophy, it stands in the tradition of John Maclean, who set up theScottish Workers Republican Party in the early part of the 20th century, combining socialist economics with a goal of Scottish independence. A referendum on Scottish independence was announced by the Scottish Government shortly after the Scottish National Party won an overall majority in the 2011 elections to the Scottish Parliament. The SSP campaigned for a Yes vote in that referendum, with its co-spokesperson Colin Fox sitting on the Advisory Board of Yes Scotland. In May 2013, Fox described a vote for independence as a “significant defeat for the British state and its stranglehold over our economy, society, culture and politics”, as well as an opportunity to “[repudiate] neo-liberalism, corporatism, the financialisation of our economy and existing class relations”. He added that he believed the referendum could won “by persuading our fellow Scots of independence’s transformational potential”. National spokesman, Colin Fox arguing the position for a socialist Europe. The Scottish Socialist Party supports Scotland’s continued membership of theEuropean Union (EU), though condemns its present structure as a “neoliberal trap”. The SSP’s 2015 manifesto reiterates the party’s commitment to “working in a pan-European socialist alliance to achieve our goal of a socialist federation of European nations”, while maintaining there would be no “greater democratic and economic progress” for workers outwith the EU compared to within it. In February 2016, the party re-affirmed its position at a National Council meeting in Dundee. It agreed to back the UK’s continued EU membership in the United Kingdom European Union membership referendum and to “campaign for a socialist Europe which is democratic, pursues peace in the world rather than warmongering, welcomes refugees, and above all where the riches of the continent are shared out equally between all its 500 million citizens”. The Scottish Socialist Party proposes a form of local income tax to replace council tax. The council tax, which was brought in after Thatcher’s poll tax became non-viable, is based on the value of the household in which the taxpayer lives; the party argues this can lead to unfairly high taxation for tenants and pensioners. In 2004, the SSP launched its “Scrap the Council Tax” campaign, boosted by a poll suggesting 77% of people in Scotland supported the abolition of the tax. A bill proposing a progressive system of taxation based on a household’s income was presented in 2005, but was defeated with 12 MSPs in favour, 94 against, and 6 abstaining. Although the Scottish Liberal Democrats, the Scottish National Party, and the Scottish Green Party supported the concept of income-based taxation, all three parties disagreed with the SSP’s specific proposals, which would have exempted anyone with an annual income of less than £10,000 and reduced liabilities for anyone with an annual income of less than £30,000, while targeting revenue generation to those with household incomes in excess of £90,000. In 2005, Colin Fox MSP proposed a bill to abolish NHS prescription charges. The bill was voted down by Labour, Conservative, and Liberal Democrat MSPs. In response to the bill’s introduction and the publicity that it generated, the Scottish Executive announced a review of the impact that the charges had on the chronically sick and full-time students—just three hours prior to the bill being debated. Prescription charges were eventually abolished on 1 April 2011, through legislation put forward by the Scottish National Party. Nicola Sturgeon later wrote to Colin Fox to acknowledge the SSP’s contribution in the campaign for abolishing prescription charges. Frances Curran MSP led a campaign which included children’s and anti-poverty organisations for the provision of free and nutritious meals for all to tackle the problems of poor diet and rising obesity amongst children. This claimed to be able to eradicate the stigma associated with the current means-tested system and also ensure that meals provided in school conformed to minimal nutritional standards. A bill to this effect was proposed in parliament in 2002, but was defeated. However, a subsequent Scottish Executive consultation found that 96% of respondents were in favour of free school meals. A redrafted bill was launched in October 2006 and was resubmitted to the parliament, but it was announced in November 2006 that this bill would not be taken in that session of parliament due to time pressures. Frances Curran had pledged that the SSP would resubmit its bill early in the next session of parliament and announced a text service for supporters to text Jack McConnell to demonstrate their support for the free school meals bill. However, the SSP’s exit from parliament at the 2007 election prevented this. Under pressure from the SSP and the wider campaign, the Scottish National Party introduced free school meals as a pilot scheme for a small number of primary school pupils in selected local authorities and have announced that there will be free school meals for Primary 1-3 children from 2010, however they have not backed the wholesale change that the SSP proposed. Such a scheme in Hasselt, Belgium, revived by the provision of free public transport, and was a key plank of the Greater London Council‘s policy platform in the early 1980s. [clarification needed] Tallinn, the capital of Estonia, introduced free public transport for residents in April 2013 to considerable economic benefit, adding more precedent for the SSP’s policy of free public transport. The SSP also aim to establish a Scottish National Bus Corporation, which would be publicly owned and democratically run by regional boards. Privately run bus corporations would also be re-regulated. On the expiration of the First ScotRailfranchise in November 2014, the SSP called for it to be transferred to a publicly owned and democratically managed Scottish National Rail Corporation. The SSP has proposed the legalisation of cannabis and the licensing of premises to sell cannabis as a means of breaking the link between soft drugs and potentially lethal drugs such as heroin. It has also proposed the provision of syntheticheroin on NHS Scotland under medical supervision in order to undermine the black market for drugs and combat the social and health problems caused by illegal drug use in working class communities, as well as calling for the expansion of residential rehabilitation and detoxification facilities for addicts seeking treatment. The SSP is currently involved in a campaign to raise the national minimum wage to £10 an hour. The party has, since its foundation, called for the minimum wage to be set at two-thirds of the male median salary. The SSP, affiliated to the Scottish Palestine Solidarity Campaign, is a strong proponent of an independent Palestine. Cllr Jim Bollan successfully moved a BDS motion on West Dunbartonshire Council in 2009. Bollan has described BDS as “an ethical issue for local councils”. In July 2014, the party published a statement condemning the recent escalation of violence in Palestine as “Israeli aggression against the people of Gaza”. The statement called for international pressure to end Israel’s attacks and backed “peace forces in Israel who are dismayed and sickened by the actions of their government”. The party also declared its continuing support for the Palestinian people in their struggle for justice and statehood. The SSP campaigned against the wars in Iraq and Afghanistan, and was one of the founding members of the Scottish Coalition for Justice not War in September 2001. The February 2003 march against the war in Iraq in Glasgow was largely organised by SSP members. It worked closely with Military Families Against the War, particularly in the Justice 4 Gordon Gentle campaign, standing down in the 2005 general election for Rose Gentle in the East Kilbride constituency. In 2009, the grandmother of Dundee soldier Kevin Elliot, who died in Afghanistan, joined the party because of its firm anti-war stance. The party has also campaigned against rendition flights, including introducing a debate in the Scottish Parliament over the issue, and against the lack of response from the UK government in Israel’s war on Lebanon. It has supported non-violent direct action as a tactic to oppose the presence of weapons of mass destruction in Scotland and strongly opposes the replacement of Trident. It has participated in the blockades at Faslane nuclear base since its inception and a number of SSP members have been fined and/or jailed after blockading the naval base at the annual Big Blockade. In 2005, Rosie Kane locked herself on to a 25 foot Trident replica outside the Scottish Parliament, only releasing herself after the replica was dismantled fourteen hours later. Later that year she was fined £150 for her actions and in October 2006, she was jailed for 14 days after refusing to pay the fine. In January 2007, three SSP MSPs were arrested, later released without charge, while in June 2007, five members of the SSP’s youth wing were also arrestedand held overnight, after blockading the base as part of the Faslane365 campaign. The party supported the Scrap Trident demonstration in Glasgow in April 2013. The party was active in the protests against the G8, joining the Make Poverty History march in Edinburgh and participating in the G8 Alternatives Summit. Independence, Socialism and the SSP pamphlet cover. Alongside the Scottish Socialist Voice, the party has published a number of pamphlets setting various policy positions in greater detail than in the party’s election manifestos. A pamphlet called The Case for an Independent Socialist Scotland, was launched on 11 September 2013 and was welcomed by MSPs. In 2015, the party published Break the Chains, a book by SSP workplace organiserRichie Venton in which he argues the case for an immediate £10 an hour minimum wage, without discrimination; a national maximum wage; a shorter working week; and strategies to “unchain the unions”.